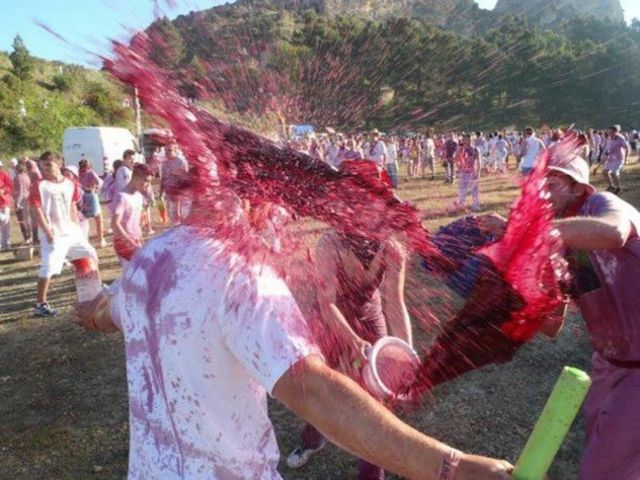 Batalla de Vino in Haro (La Rioja) – Their T-shirts used to be White! Held in the historic, picturesque town of Haro, in the Rioja region, about 100 kilometres south of Bilbao, thousands of people turn up for one of Spain’s most exuberant festivals every June 29th, Saint Peter’s Day. 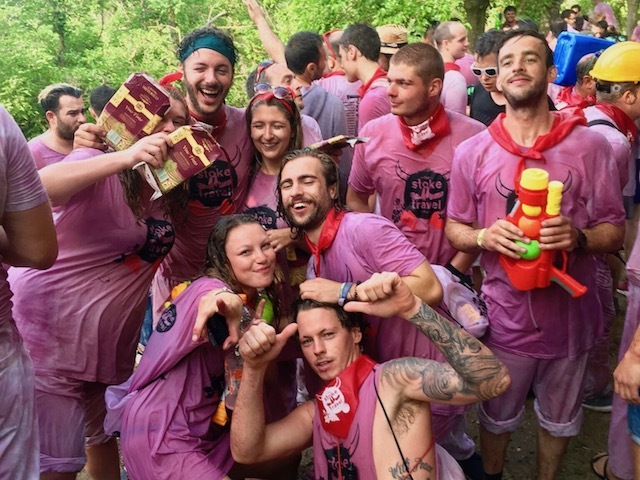 Book an all-inclusive camping trip to La Batalla del Vino with Stoke Travel and get freebies like unlimited beer and sangria by adding the word “FIESTAS” on the booking form. Haro is in what is now known as Rioja Alta, where about 40% of the region’s vineyards can be found, and is a town totally devoted to the grape. The Museo del Vino and the number of bodegas open to the public all give evidence of just how vital wine production is to the town’s economy. And the Batalla del Vino is just the ultimate celebration of wine. It all evolves, apparently, from a land dispute between two neighbouring towns, Haro and Miranda De Ebro, dating back to the tenth century. The battle itself seems to have started at the beginning of the twentieth century. Nowadays, the town of Haro, its 10,000 inhabitants joined by many, many visitors, begins to get the festivities under way a week before the battle itself. Visitors can look forward to the fact that Haro is renown for the quality of its tapas, as well as it being in the centre of Spain’s major Rioja-producing area. On the big day itself, a parade of horsemen leads everyone the 7 km up to the Hermitage of San Felices de Bilibio, where a flag is ceremonially placed and a mass celebrated. Then, the battle commences. Most people wear white at the beginning of the fight and everyone has containers such as jugs, bottles, buckets, water pistols, hose pipes – anything, really, and soon the whole world seems to turn completely pink. It’s no good turning up and expecting to stand back and watch; everyone is a target, so don’t wear your best clothes. This all continues until about midday, when everyone goes down to the bull ring in the town and the youngsters chase similarly young bulls around. What follow then are hours and hours of dancing, eating, competitions and drinking. If you’re driving to Haro, from Madrid take the A1/E5 motorway north and from Bilbao the AP68 due south. The nearest large airport is Bilbao, but the town does have good rail links with Logroño and Vitoria. There are several well-established hotels in the town – notably Occidental Los Agustinos, which is a parador-type hotel in a wonderful old building that was once a convent. There’s also a camping site nearby with capacity for 600 tents. 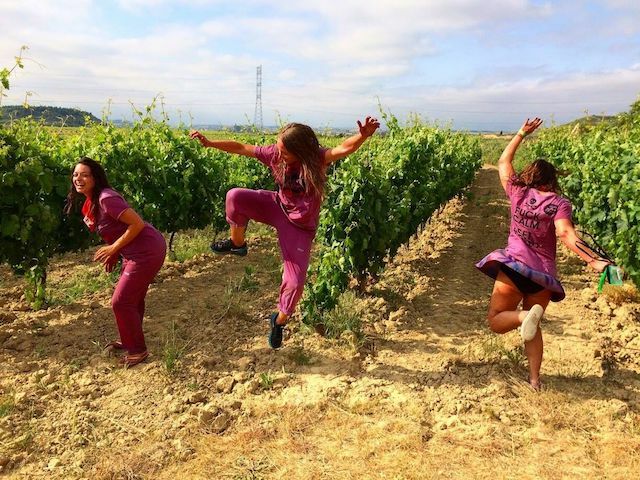 Many young people like to join a tour party and enjoy the wine fight in the company of other fellow revellers. 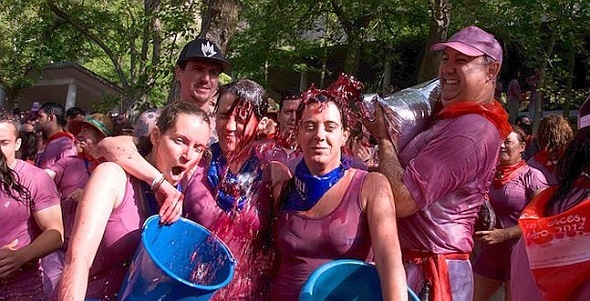 Spain has quite a few wildly exuberant festivals, where people end up getting covered in everything from tomatoes to mud. Amongst all these, though, the Haro Batalla del Vino still stands out as being totally crazy, unadulterated, fabulous fun.